If a patient is in advanced stages of gum disease or tooth decay and needs all their teeth removed, dentures can be fabricated to match the shape of your smile. 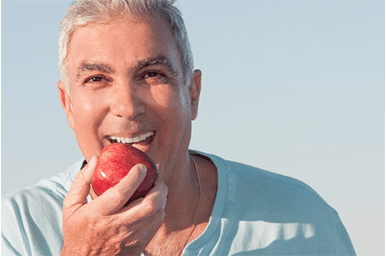 Immediate dentures are a popular choice because the patient will not have to be without teeth. Once teeth are extracted, the jaw bone starts to remodel and shrink until the bone stabilizes. To accommodate the new shape of the jaws, the denture will need to be relined. Dental implants can also be used, if enough bone is present, to secure your dentures. Partials are used when some natural teeth remain. They are removable and it helps prevent other teeth from changing position. Usually consists of replacement teeth attached to a pink plastic base that is either connected by a metal framework attached to existing teeth or other connectors that are more natural looking if there is enough room.